Liberty’s Teegan Pifher drives to the hoop during a game last season. She returns for her sophomore season as the team’s leading scorer and rebounder. 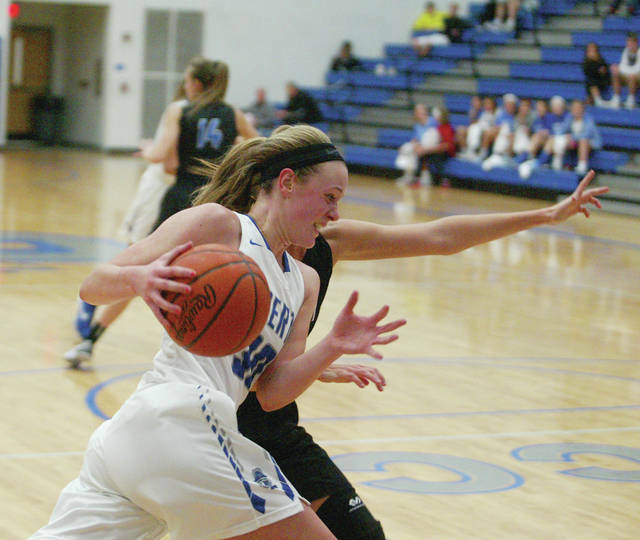 The Olentangy Liberty girls basketball team was young last season. Young … and good. The Patriots finished 16-8 overall and won the OCC-Buckeye Division crown with an 8-2 mark punctuated by a thrilling one-point win over Westerville North in the second to last game of the regular season. This season, youth won’t be as much of a problem and, well, who knows how high Liberty will fly. The Patriots have five starters back in the fold. Seniors Kennedy Kashmiry, Sydney Englehart and Emma Humenay, who started the last eight games after starting point guard Bre Yashko got hurt, are all ready to roll. Sophomores Teegan Pifher and Kelly Levering are also back after posting solid seasons as freshmen. A common theme among the group, according to Liberty coach Sam Krafty, is improvement. All five were good last year … and all five got better. “Teegan led the team in scoring and rebounding last season and is much improved, especially on the perimeter,” Krafty said. “She’s stronger physically and ready for a huge year. “Kelly has really had an impressive offseason, can play four positions, score inside or from deep and she’s stronger, quicker and really coming on strong. Others contending for starting spots and big roles include sophomore Gina Santangelo and juniors Abigail Erikson, Jess Barna and Betsey Merritt. “Gina had a key role last year in our last eight games,” Krafty said. “She’s probably our truest point guard, can score, is the best rebounding guard I’ve coached and has a knack for making plays. Junior guard Kierra McCloskey and seniors Lauren Spicer, Jessica Thomas and McKenna Bay will also chip in. Krafty said his team is as close as it is talented. Shooting is a strength, but success will stem from what the team gets done on the other end of the floor. Liberty opened the season with Tuesday’s 51-43 win over Hilliard Bradley and returns to action Friday against visiting Dublin Jerome.